The PDair iPAQ leather case range are hand crafted from the highest quality soft leather with a fine white hand stitched edge offering a truly professional appearance without sacrificing any functionality. This small investment will protect your iPAQ against the rigors of everyday life. 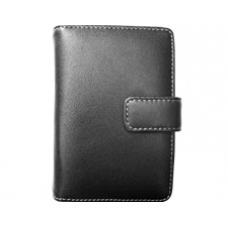 This book style leather case also offers additional storage comprising of 1 removable photo pocket, 1 universal pocket, 3 credit card slots and 2 memory card slots. The Leather iPAQ case allows easy access to memory card slot, stylus, IR, power button, stereo output socket, and voice recorder button and synchronisation socket. * High Quality PDAir Leather Case. * Book Style with Magnetic Snap Stud. * Slot for a Stylus Included.